Most of the stories in this blog involve puppets, props, and/or technology, but I also like go "beyond the book" with oral storytelling. Oral tales seem to be most often used with school age kids, but there are some stories that are really just right for preschoolers. It's pretty impressive how easily they get into a tale, how willing they are to use their imaginations to fill in the details without pictures or puppets or anything. And it's a great way to develop early literacy skills, especially Narrative Skills, Phonological Awareness, and Vocabulary....when you're just listening you need to pay attention to words and sounds even more keenly and in different ways. I start out by asking if they're ready for a monster story, in a kind of mock-scary voice. You can see them getting a bit nervous, until I reveal that the monster is: "The Bellybutton Monster!" Then they get that it's just going to be funny. Just the word bellybutton is enough to make a four year old laugh. In the story, a girl named Rosie thows off her covers every night which drives her dad crazy (I use girl/dad instead of boy/mom). Participation is almost required in any oral tale for preschoolers, so together we pull up the covers to her chin. Then we roll our arms (like a travelling call in basketball) and fling them to the side each time she tosses her covers off. I just do that twice, then jump right to the Bellybutton Monster's appearance. He pulls off the bellybutton with a "Pop!" (more participation) and flies off. At this point the kids aren't sure what to think, but when Rosie has a drink of orange juice in the morning and it squirts out of her bellybutton, they always laugh a lot. Then there's the bath, where her stomach fills up with water and she has to squeeze it all out. When she goes back to the bed there's another refrain of tossing off the blankets, and the Monster returns. I have Rosie bring a regular button to bed (the one prop in the story, although it's optional to use) which she offers to the Bellybutton Monster in a trade. You can build this up a bit if you want: "But that night, she brought something special to bed with her...what do you think it was?" When the Monster arrives there's another funny bit where the Monster replaces her bellybutton, each time with a "Pop!" but it's in the wrong place (ear, nose, etc.) He finally gets it right, flies off, and Rose never throws her blankets off again. The story has many of the qualities that you need with an oral tale for preschoolers: Participation, as mentioned; A pattern, so they can hold the story in their head easily; Surprises in the pattern, to keep them guessing and wondering; A world and stuff that they know about already: basically bedtime and bellybuttons; and silliness that works right at their level. Participation from the kids increases each time a refrain recurs. I don't rehearse them before hand, just when the moment comes in the story: "She threw off her blankets [I roll my arms]...can you do this with me [roll them again, and the kids join in.]" For the "Pop!" sound, it's just drawing out the words just before so they know it's coming: with.....a.........Pop!" One more note about storytelling with preschoolers: I usually introduce an oral tale by pointing out how many ways there are to enjoy stories: sometimes with books, sometimes with puppets, and sometimes with nothing but our imaginations. It helps to kind of set the stage and cue them that they're going to need to listen and think in a slightly different way. When I had a smaller weekly storytime I would include one oral tale each week, and they really got used to it, but for some it's a new experience. "First Sam feeds.....[reach into bag and pop out...]....Giraffe! For Giraffe, Sam has brought....[hesitate, let kids guess while you reach for the prop]...leaves! 'Hello, Giraffe! I've brought you some nice green leaves today.' 'Thank you Sam!' Leaves are just what Giraffe likes best." 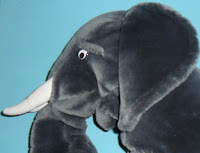 The gentle, friendly interaction with props and puppets is nice, but when he gets to Elephant...Sam's wagon is empty! This is one of those nice moments when you get to watch your audience of two year olds, who were so comfortable with reliable old Sam and the clear repetitive pattern of the book start to get worried. So far they only had to think about which animal would come next and what the food would be. They never dreamed he would skip someone! And as Elephant calls out ("Sam....did you forget?") there's just enough of that toddler tension to set up the triumphant ending, where Sam reappears with a wagonful of hay. Because Elephant is just so very large that Sam needs a whole wagon to carry his food. 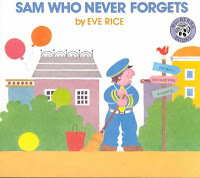 And the happy ending is perfectly punctuated with "three cheers for Sam, Sam who never ever forgets." For Toddler Times, this story works fine with just three animals plus elephants. I typically use Monkey, Giraffe, and Crocodile, mostly because I have the food props to match: Banana, Leaves, and Small Child (just kidding...Fish). For Elephant's hay I just drag out the paper cutter and yellow construction paper and chop up a bunch of strips. Sam can be any person puppet (male or female and you don't even have to change the name). I've also told it without a Sam puppet, acting as the Zookeeper myself, and that works okay too. The first times I did this (early 90's) I used to go a little farther, setting the animals up on chairs, using a box decorated to look like a wagon and, as Sam, walking from one to the next. It's more of a production, and in the end really didn't add anything to the heart of the story, so as usual I opted for the more basic approach. Plus this meant I could remove the box-that's-decorated-to-look-like-a-zookeeper's-wagon from my limited prop storage place (though come to think of it, the box was also just right for The Box with Red Wheels by the Petershams, an even older book which I haven't done for quite a while). 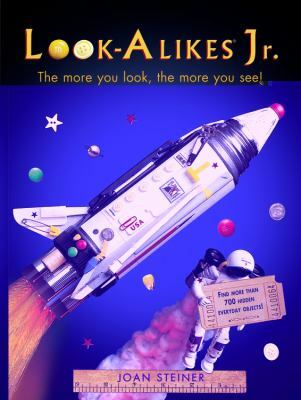 I have to admit I've always been just a bit bothered about the logic of this otherwise perfect picture book. We know Sam feeds the animals every day. And every day he must have the same situation: he needs to make a separate trip for Elephant's food. So does Elephant forget that this is going to happen every day? Is the same drama going to play out tomorrow, and the next day, and every day from now on? Is Elephant that forgetful? Or is this maybe Elephant's first day at the Zoo? But if so, why does he seem to be familiar with Sam already? I know, this is more thought than you need to put into a picture book, especially one that captures this moment so perfectly, and of course no child or parent has ever raised this question....but I still think about it every time I share the book. Keiko Kasza is a favorite of mine (and of many Storytime presenters). Her books have just the right amount of action and humor, and are usually paced just right for group sharing. 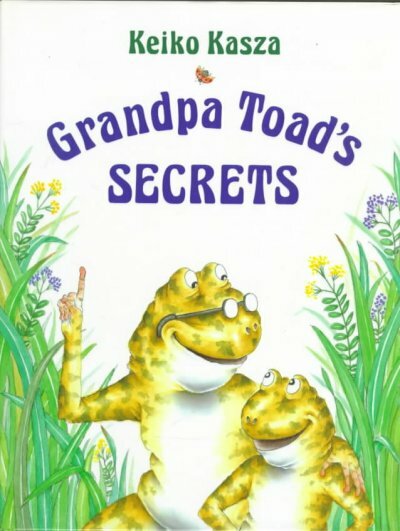 For a "Monsters" themed Family Storytime, Terri and I decided to do Grandpa Toad's Secrets, which I've shared often as a straight read aloud in the past. For our larger group, we decided to combine an "act-out" with selected scanned illustrations from the book. 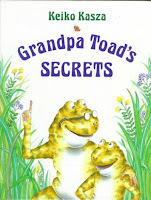 So as Grandpa I explain to Terri (as Little Toad) how we toads must be brave when facing enemies. Then the illustration with the hidden Snake creeps across the screen, while Little Toad says "I don't see any enemies." This brings the kids into it, as they point out the image behind us. We take a look, then show another image, this one of the snake stretched menacingly above (appearing with a "zoom" effect to make it a bit dramatic). Grandpa Toad then talks directly to the Snake on the screen about how toads can be too big to eat, and "puffs himself up." The image switches to one of the Snake bending down crestfallen, then a bit more simple animation as he slides off of the screen. We follow the same pattern with the Snapping Turtle. One image of him hiding; one of him threatening; and one where Grandpa Toad has tricked him, and an exit. Just using selected illustrations like this keeps the focus on the characters, and when the images appear we interact with them as if they were puppets or people....kind of different, but it works. We're also careful to retain Kasza's well-chosen phrases: like the way Grandpa Toad declares "Not a bit!" when Little Toad asks if he's scared, for example, which sets up the twist that comes next neatly. The third creature is a "humungous Monster," and this time Grandpa Toad is scared, and runs away. In the book, the Monster grabs Grandpa and is about to eat him. We couldn't figure out how to interact with the images to that extent (but how cool if we could have made a little animated Steven with his Toad hat on and inserted it!) So we have Grandpa just hide while Little Toad tricks the Monster. For that, we show the image of the Monster's legs from the book, and while Little Toad mimes throwing berries, each click of the remote sends a red dot on a "motion path," so it kind of looks like the dots really were coming from Terri's hands and landing on the image. The Monster runs away (more motion paths criss-crossing the screen, with the image getting smaller each time) and then there's that satisfying Kasza ending, where Grandpa Toad reveals that the third secret is having a "friend you can count on." Our January K-2 Book Adventure program featured "Trickster Tales." The core of this program was four tales, and we mixed up some other "tricky" books to provide variety. 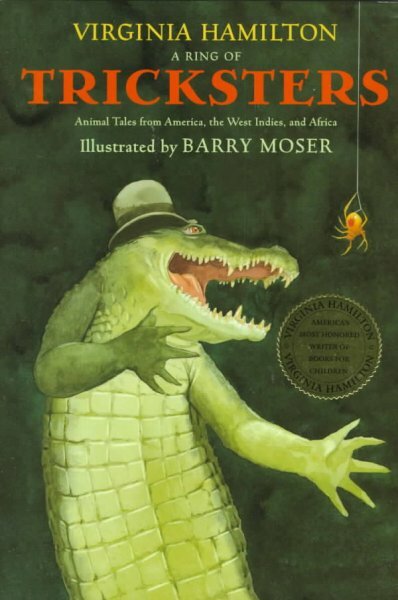 The tales included Gerald McDermott's Raven and Anansi and the Moss-Covered Rock by Eric Kimmel and Janet Stevens...click on the links to see details of those. One nice thing about those two books is Kimmel and Stevens have done several other Anansi tales and McDermott has a series of trickster tales that have a similar look, so we gathered multiple copies of those as well and most of them checked out. 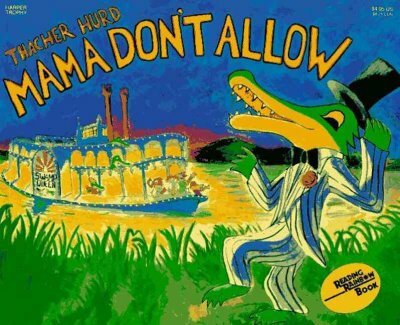 For Thatcher Hurd's Mama Don't Allow we brought kids up from the audience to be the "Swamp Band." Terri was Miles, I narrated, and Sheila was a hungry Alligator. In the book, parents and townspeople comment at how awful the band sounds, so we projected their comments in word bubbles on the screen ("Play outside!" "How dreadful!") and had the audience read them. "The Dancing Gator" was adapted (very broadly) from "Buh Rabby and Bruh Gator," a story in Virginia Hamilton's A Ring of Tricksters. 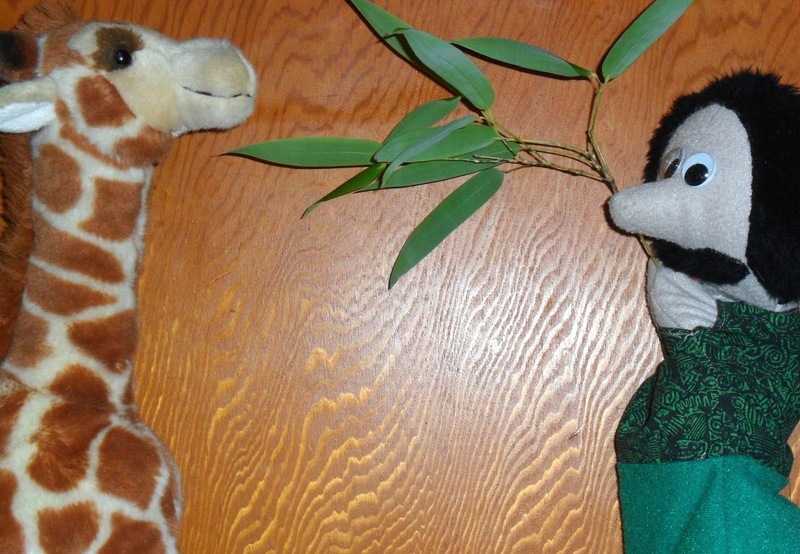 This has been a long-time favorite of mine to tell with puppets, but my first chance to act it out with a partner. I'll try to do a full blog entry on that one in the near future. A Ring of Tricksters isn't easy for younger readers to manage, but it has some great readalouds for adults to share, and I was pleased that several copies got checked out. In between the four tales, we highlighted books that were tricky in different ways. One of our goals or this K-2 Book Adventure program is to expose kids to a wide variety of books, including non-fiction, picture books, poetry, and anything else that fits. "Tricky Photographs": For Look-Alikes Jr. by Jan Steiner we scanned three of the illustrations, projected them, and had the kids identify the everyday items that are used in the amazing photographed scenes. We'd name an item ("where's the spatula on the rocket?") and then with a PowerPoint click we'd add an arrow pointing right to it. And of course we had the others in the series available too. 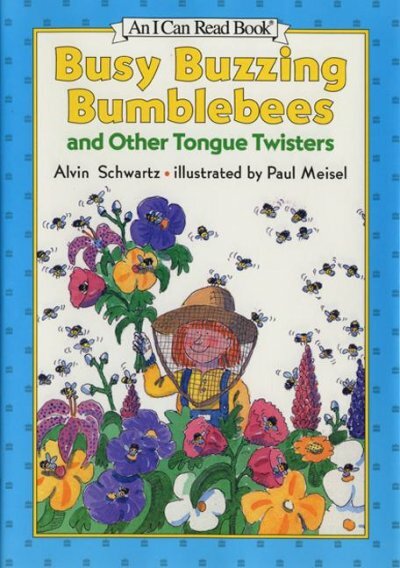 "Tricky Words": We scanned and tried out a few tongue twisters from Alvin Schwartz's Busy Buzzing Bumblebees (illustrated by Paul Meisel), which is just right for this age group. And had more tongue twister books on hand for checkout. "Tricky Nature": We used the very cool book Where in the Wild (David M. Schwartz and Yael Schy, photos by Dwight Kuhn). 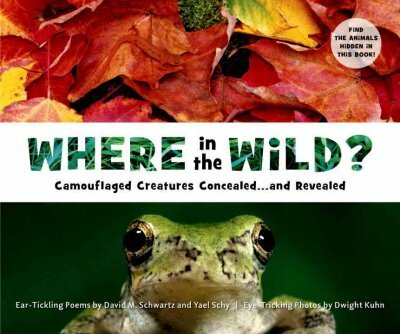 In the book, you see a photo with a camoflauged animal, then turn the page and see the same page with everything but the animal visually muted. This worked great when transferred to PowerPoint and used with animations. We scanned both pages and had the front one very slowly "Exit/Dissolve" while the next page very slowly "Enter/Dissolve," so you'd gradually see the hidden green snake emerge. Another of those rare cases where I have to grudgingly admit that technology works as well as the printed page (but you still can't feel it or smell it). And since we never expect this group to sit still for 45 minutes, we added a "Tricky Game," to get them moving, a variation of "Simon Says" that Terri led. There are times when working our themes into a cohesive program takes some struggling, but this time the combination of tricky tales and tricky non-fiction seemed like a nice and natural mix.